YES, I am guilty. 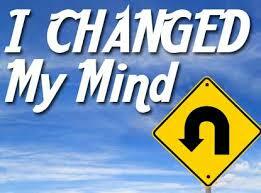 I changed my mind – AGAIN! I have tried THREE different newsletter services, only to realize that the most efficient way to disseminate information about SIGNING FAMILIES, the 411 VOICES network (including my radio show) and more was via my WORDPRESS blog! YES, I promise to make sure that the content is equally, if not MORE GROOVY, than what was in my prior newsletters! HOW TO GET the Newsletter? Simply go to my sidebar on this blog and complete the FOLLOW THIS BLOG BY EMAIL request or if you use WORDPRESS you can opt to press the automatic FOLLOW button! A NEW NEWSLETTER (say that three times fast) will be available for your reading enjoyment, very soon! Plus, if you know my “style” you will soon learn that I love VIDEO content, too! THANKS for reading this post to the end. Now go ahead and wander over to the SUBSCRIBE button. If you already have SUBSCRIBED I THANK YOU!! !